VIDEO CARD: Graphics card with 128 MB of VRAM and pixel shaders. NLW is supposed to be a MMORPG with thousands users. This is a minimal networking infrastructure to manage and let play a lot of players providing them some services like the mobile interfaces, support for in-game communities, an on-line viewer for personal stats and the configuration of own Co.R. 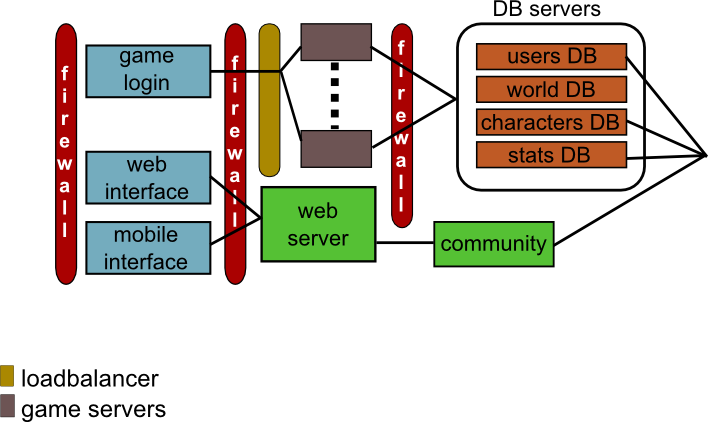 In details: between the first two firewalls are located the user interfaces: Web and mobile interfaces and game login. We call this zone DMZ (Demilitarized Zone). Beyond DMZ there are the web server, the community services and another firewalled zone where the game servers are placed. A loadbalancer, between the firewall and the servers, will distribute the servers workload. We need more than one game server in order to quickly manage the players in the different parts of NLW world. The game servers need to be placed in the countries where the most players are located in order to reduce the RTT and consequently offer a low latency service. The computational power of game server has to be enough to manage hundreds connections and all the game mechanics. The client has only to send requests to the servers, game servers will elaborate them and so it will send the replies. Requests are sent/received using a specific application protocol. Furthermore, several databases are needed. In order to manage the game NLW system needs a character DB and a world DB. The characters DB contains all the informations about the in-game character. A character is uniquely linked to a user account so it is very important to have a separated users DB so it is possible to manage users' informations without interferring in game. The world DB is a huge DB that contains all the information about the world and the game mechanics. In addition to these three databases NLW need a stats DB. This DB will contains all the achievements and the game statistics for each character of each user. In this way there will be a complete set of game information separated from the server code and located behind a complex firewalls system.